Agropolis Foundation’s Louis Malassis Young Promising Scientist Awardee for 2015, AfricaRice agronomist Kazuki Saito (3rd from left) with P. Kosuth, Director, Agropolis Foundation (1st from left), Henri Carsalade, Chair of the Board, Agropolis Foundation (2nd from left) and Wayne Powell, Chief Science Officer, CGIAR Consortium (4th from left). Photo courtesy of S.Zwart, AfricaRice. 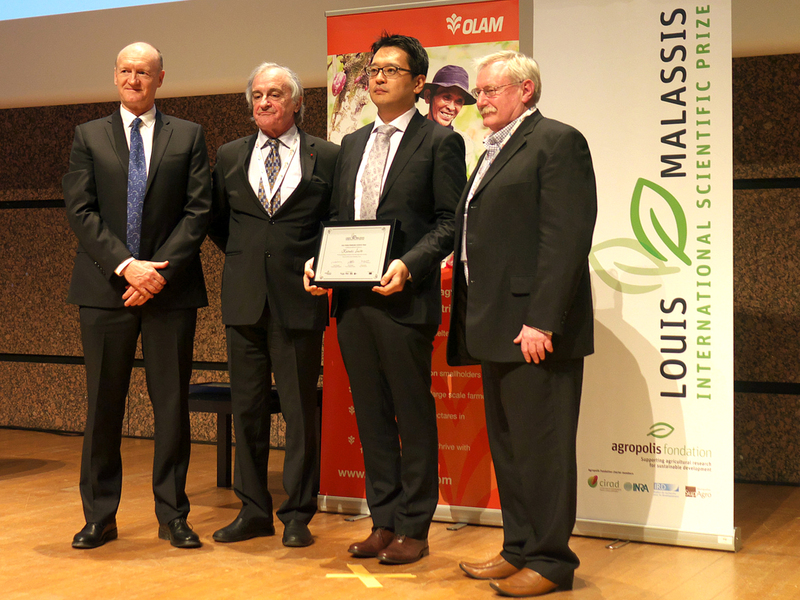 COTONOU, Benin, 17 March 2015 – Dr Kazuki Saito, AfricaRice agronomist from Japan, was awarded the Agropolis Foundation’s Louis Malassis Young Promising Scientist Prize in a ceremony held on 16 March 2015 in Montpellier, France, during the Global Science Conference on Climate-Smart Agriculture 2015.